I love photographing weddings at the St. Regis in Monarch Beach, near Dana Point, California. The property is just gorgeous, and features three separate ceremony locations -- the Grand Lawn, the Pacific Lawn, and the Botanical Gardens. For this wedding, the bride and groom chose the Botanical Gardens, which is a charming location for smaller weddings. The greenery is tropical and lush, and the wrought-iron gazebo is easily decorated into any style a couple might want. 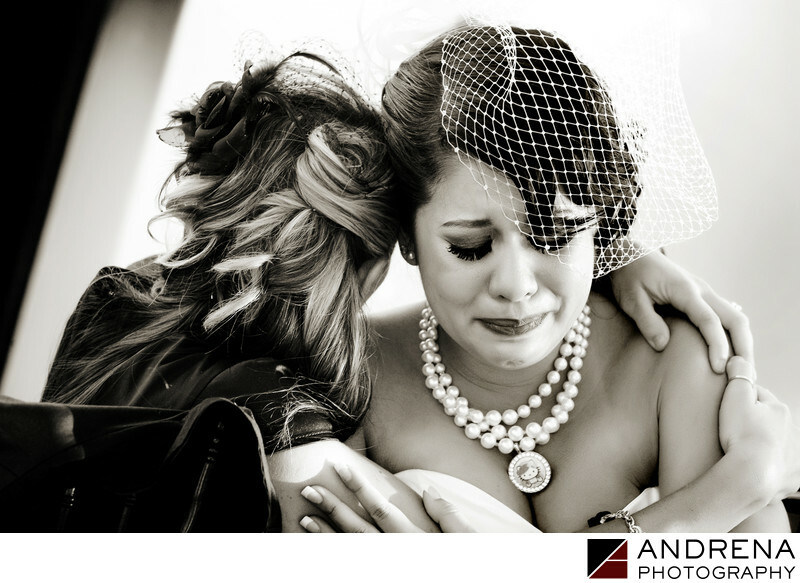 Every photographer loves finding emotion at a wedding, and this wedding did not disappoint. This is one of my favorite images ever taken during a toast. The bride was very emotional throughout the day, which provided a ton of great photo opportunities. During the reception, a particularly poignant toast made the bride start crying, and one of her bridesmaids leaned over to comfort her. I have included this photo in my portfolio for many years, and it is often mentioned by potential clients as a favorite photo. Wedding photographed at the St. Regis in Monarch Beach, California.